Pupils in KS3 have a one hour lesson each week in mixed groups. Those who choose to study Fine Art for GCSE have 6 hours in year 10 and 5 hours in year 11 of lesson time spread over two weeks. Worksheets, sketchbook based. Pencil and pens. Line and tonal drawings of everyday objects. Line and tonal drawings from A4 photographs. Use of a window viewer to enlarge. Variety of media. NATIVE AMERICANS Oil pastels and poster paint – working on a larger scale. HIEROGLYPHICS – water colours, ink pens. Signs and Symbols continued, looking at ABORIGINAL symbols. Final development SPORT – small designs linked to chosen sport (ref to Olympic Pictograms) then larger designs. Sketchbook based. First study Michael Craig Martin. Overlapping line drawings of art room and personal objects. Velazques Las Meninas – individual research and transcriptions. Concentrate on presentation. Link to Picasso and then individual choice. Drawing skills – single point, double point. Drawing buildings (extended home learning) Windows and doors. Larger scale and variety of materials looking at buildings/architecture. Floor plans and dream houses. ROSENQUIST ‘I Love You With My Ford’. Favourite person, object, food. Planning sheet. Final outcomes – variation in materials, scale, theme. Paintings on canvas. self-chosen theme from working title. Overview of Op Art, study two named artists, present work creatively. Final outcome – Painted canvas, painting, drawing, mixed media, collage. Choice of materials and scale. Choose one. Research artists who have been inspired by the above. Continue to develop your chosen theme. Use a wide variety of materials – experiment and vary the scale of your studies. Introduce drawings and photographs that you have taken that support your project. Write careful notes and annotations explaining your ideas. Year 10: Summary of work completed, including time scales. Year 11: Summary of work completed, including time scales. End of unit assessment and feedback – usually half termly. KS3: Pupils are given a variety of homework tasks linked to the current project. KS4: GCSE pupils are expected to work independently in their sketchbooks throughout the course. The Art Room is available to students from all years at break and lunchtime every day. Priority is given to year 11 students during the ‘Externally Set Task’ period in Spring Term. When required there is the opportunity for further workshop time after school and during the Easter Holiday. 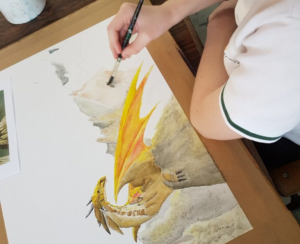 Year 10 pupils are given the opportunity to work with visiting artists from Grassington Festival and have made a number of very successful large art installations displayed during the event.